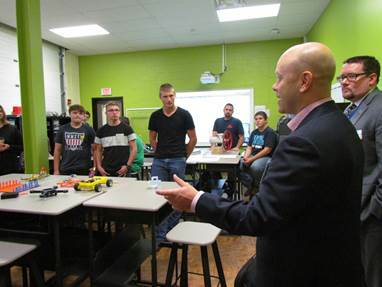 Pictured above, at left—educators, workforce development officials, and members of Athenex’s leadership team tour the Dunkirk High School Science Wing; at right—Steve Panaro/Athenex speaks to students during a tour at WNY P-TECH STEM College & Career Academy. DUNKIRK, N.Y.: — Ever since the announcement that Athenex expects to bring an influx of employment positions to Chautauqua County, county officials and educators have been preparing for the future workforce needs. Athenex, in partnership with Empire State Development and New York State, anticipates bringing 900 jobs to the county through its high potency oncology drug manufacturing site. Chautauqua County Executive Vince Horrigan and the Chautauqua County Education Coalition have been actively working with Athenex. Collaborative efforts are ongoing with Athenex and representatives from the Chautauqua County Education Coalition, Jamestown Community College, State University of New York at Fredonia, Erie 2-Chautauqua-Cattaragus BOCES, Dunkirk City School District, Fredonia Central School District, WNY P-TECH STEM College & Career Academy, Manufacturer’s Association of the Southern Tier (MAST), Dream It Do It, Chautauqua Workforce Investment Board, Northern Chautauqua Community Foundation Local Economic Development Committee, and County of Chautauqua Industrial Development Agency (CCIDA). 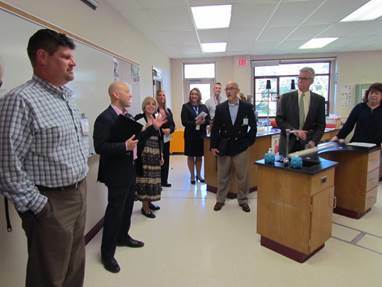 Most recently, five members of Athenex’s leadership team toured several Chautauqua County schools. Organized by the CCIDA, this tour provided opportunities for Athenex team members to become familiar with curriculum, training programs, facilities, and training equipment available to educate their future workforce. The day began at WNY P-TECH STEM College & Career Academy at the Erie 2-Chautauqua-Cattaraugus BOCES LoGuidice Educational Center in Fredonia. Horrigan kicked off the day’s events, highlighting the ongoing collaboration and positive progress for Athenex and the county. ” I was at the Athenex board meeting three weeks ago and corporation executives were thrilled that our education institutions have been proactive in preparing our students to be ready for the jobs in the pharmaceutical manufacturing industry,” said Horrigan. Participants then enjoyed several presentations and demonstrations from current ninth and tenth grade P-TECH students. They also viewed architectural renderings of P-TECH’s future Benson Street facility in Dunkirk, N.Y.
At both Dunkirk High School and Fredonia Central School, participants visited classrooms, toured science and computer aided design (CAD) labs, interacted with students, and met with faculty members. After visiting Jamestown Community College (JCC) North County Center’s training center to discuss programs and resources, participants traveled to the JCC campus in Jamestown. There they toured both the Science Center and the Manufacturing Technology Institute (MTI). 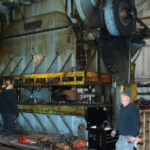 The MTI building houses a variety of programs including Machine Tool Technology, Welding Technology, and Industrial Equipment Technology. The tour also included the Science Center at the State University of New York at Fredonia. This center houses the school’s Departments of Biology, Chemistry and Biochemistry, and the Environmental Science and Science Education Programs. During a working lunch in the Science Center, the group discussed science, education, and business. Participants also discussed opportunities for interns at all levels. This tour successfully focused on open dialogue between local educators and Athenex regarding anticipated skills and educational requirements for positions at the new facility. “The community should be really proud of the people you have around the table here and what you are doing for this project,” said Steve Panaro of Athenex. Moving forward, Athenex will continue participating in the Chautauqua County Education Coalition Workforce Development subgroup. This information exchange will help local schools map curriculum pathways to best prepare Chautauqua County for Athenex’s arrival. In addition, this group will bring together Athenex and other local manufacturers to identify comprehensive workforce and training needs. About Athenex – Founded in 2003, Athenex, Inc. is a global clinical stage biopharmaceutical company dedicated to becoming a leader in the discovery and development of next generation drugs for the treatment of cancer. Athenex is organized around three platforms including an Oncology Innovation Platform, a U.S. Commercial Segment and an Internal Supply Chain. Our Oncology Innovation Platform generates clinical candidates through an extensive understanding of kinases, including novel binding sites, human absorption biology and through the application of our proprietary research and selection processes in the lab. Our current clinical pipeline is derived from two different platforms technologies we call Orascovery and Src Kinase Inhibition. The Orascovery platform is based on our belief that the next generation of cancer treatments will be driven by orally based cytotoxics allowing clinicians to potentially increase the amount of drug exposure per treatment cycle and increase the number of treatment cycles tolerated by patients. The Src Kinase inhibition platform includes novel small molecules addressing unmet medical needs that work through multi-mechanisms of action including inhibition of Src activities and tubulin polymerization inhibition. Athenex’s several hundred employees are dedicated to delivering innovative drugs that can have a life-changing impact on cancer patients. We have offices in Buffalo and Clarence New York, Cranford, New Jersey, Houston, Texas, Chicago, Illinois, Hong Kong, Taipei Taiwan, and multiple locations in Chongqing, China.